Alina, from, Switzerland, is a student in the General English Program at BridgeEnglish in downtown Denver, studying with us for four weeks. We interviewed her about her experience so far studying English abroad in the U.S.! Can you tell us about yourself? Where in Switzerland are you from and what do you do there? I live in Winterthur, Switzerland. It’s a small city next to Zurich. I work in Zurich as a product manager in a language school. My company, StudyLingua / Pro Linguis offers language courses in Zurich and also abroad. I never wanted to learn English abroad but when you are surrounded by these things every day, you also want to do it! Why Denver? Honestly, I was just looking around in our brochure and saw Denver. I never heard before from this city. I liked it! So I chose Denver. The people! Everybody here at Bridge is so kind! And the teachers are excellent! I never laughed so much in class and never learned so much in such a short time. 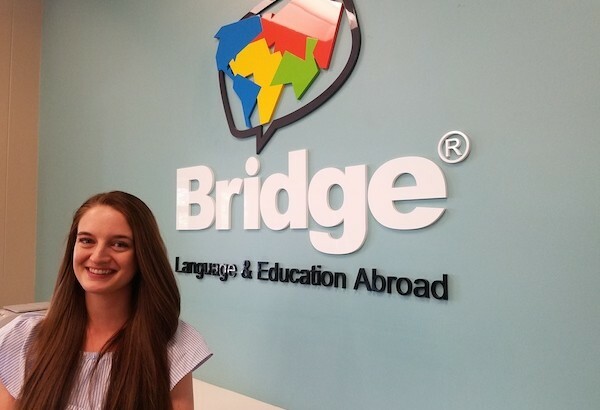 What is most difficult about studying English at Bridge? Honestly? Nothing! Everybody cares about you and will help you if you have any problems. Just my lovely family and friends and, of course, the Swiss chocolate! How has your opinion of the US changed since being here? I came to the US with no opinion. I just wanted to see how life is here without any prejudice. So now I have an opinion about the US and I have most positive thoughts! I like to hang out with my friends, attend the Bridge activities, or discover beautiful Colorado. Yes I would! Bridge says “at Bridge we are family, not just a school.” Many companies have such a vision. But at Bridge you really feel that! What advice do you have for people considering studying English in the US? First I will go to Chicago for a few days! After that I will go back to Switzerland and continue my work at Pro Linguis. I have many things I will learn in the future but I will for sure improve my English. Interested in learning more? Read 5 Reasons You Should Study in Denver, Colorado, a city named 2016 “Best Place to Live in America” by US News and World Report! esl-blog, Meet our students! Colorado, Denver, ESL students, learn English, learn English in Denver, study English in Colorado, study English in the US. permalink.